The Greater New Orleans Sports Foundation joined forces in recent years with the Greater New Orleans Quarterback Club to create the Greater New Orleans Sports Foundation Quarterback Club. 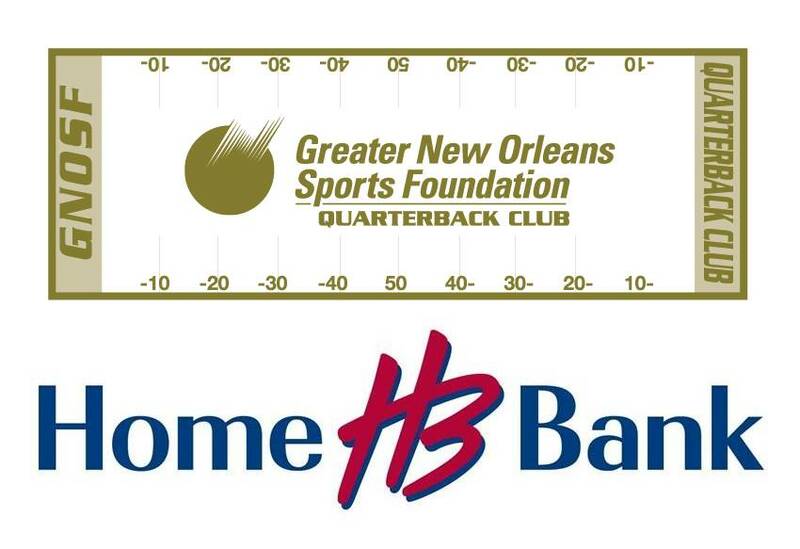 While the Greater New Orleans Sports Foundation returns as the “home team,” The Quarterback Club is pleased to announce the addition of Home Bank as the presenting sponsor in 2018. Home Bank senior vice president and New Orleans market president John Zollinger is thrilled to be joining the great tradition of the Quarterback Club. A New Orleans native and graduate of Jesuit (1985) and Spring Hill, Zollinger is thrilled to have Home Bank on board with the Quarterback Club. Greater New Orleans Sports Foundation President/CEO Jay Cicero is pleased to continue the relationship with the Quarterback Club as well. The GNOSF Quarterback Club will meet weekly on Tuesday for 16 consecutive weeks, beginning with the first meeting of the season on August 28th at noon. The organization is pleased to announce that our weekly luncheons return for a second year to Rock ‘n’ Bowl, the immensely popular New Orleans bowling and music entertainment facility conveniently located at 3016 South Carrollton Avenue. The Greater New Orleans Sports Foundation Quarterback Club promotes the very best of amateur football, along with the New Orleans Saints. Members and non-members are invited to the weekly luncheons, which are held every Tuesday for 16 consecutive weeks, with the exception of Tuesday, August 28 running through Tuesday, December 10. Annual standard membership is $50 per person with premier annual membership at $80, which includes a Greater New Orleans Sports Foundation Quarterback Club golf shirt and lapel pin, along with reserved seating. Luncheons are $20 per person for members and $25 per person for non-members. Purchase tickets to luncheons here. CrescentCitySports.com serves as the official web site of the GNOSF Quarterback Club while Compliance Technology remains a key presenting sponsor, along with WGSO 990am Radio. The weekly cost for members for lunch is $20 while non-members are welcome at $25 each. Speakers on the Saints, LSU, Tulane and prep football are featured every week. Other special guests are scheduled throughout the season. The Quarterback Club selects a prep player of the week from the metro area each week and will announce a prep player of the year at the final meeting on Tuesday, December 13, sponsored by the R&L Carriers New Orleans Bowl. For more information on how to join the Quarterback Club, contact Stan Kottemann, Jr. at [email protected] or (504) 908-6080. To learn more about the Greater New Orleans Sports Foundation Membership Program, visit www.gnosports.com or contact Tricia Lowe at (504) 619-6114 or at [email protected]. Note: For information on the club including weekly releases on scheduled luncheon speakers and all past speaker videos, click here. In support of local student-athletes pursuing higher education, Chevron will be the presenting sponsor of the High School Scholar Athlete of the Week award that recognizes a male and female high school senior from the Greater New Orleans area. The recipients will be recognized weekly at the Greater New Orleans Sports Foundation Quarterback Club luncheon. The Greater New Orleans Sports Foundation Quarterback Club promotes amateur and professional sports in the Greater New Orleans area on a weekly basis. The luncheons take place every Tuesday at 12:15 pm in the The Cannery at 3803 Toulouse Street. Award winners will be invited to attend and be recognized at the luncheon. Additionally, each recipient will be recognized on field during the 2017 R+L Carriers New Orleans Bowl in the Mercedes-Benz Superdome on December 17th. Finally, all winners will be invited to a Pelicans basketball game where there will be a drawing for one male and one female to receive a $5,000 scholarship.